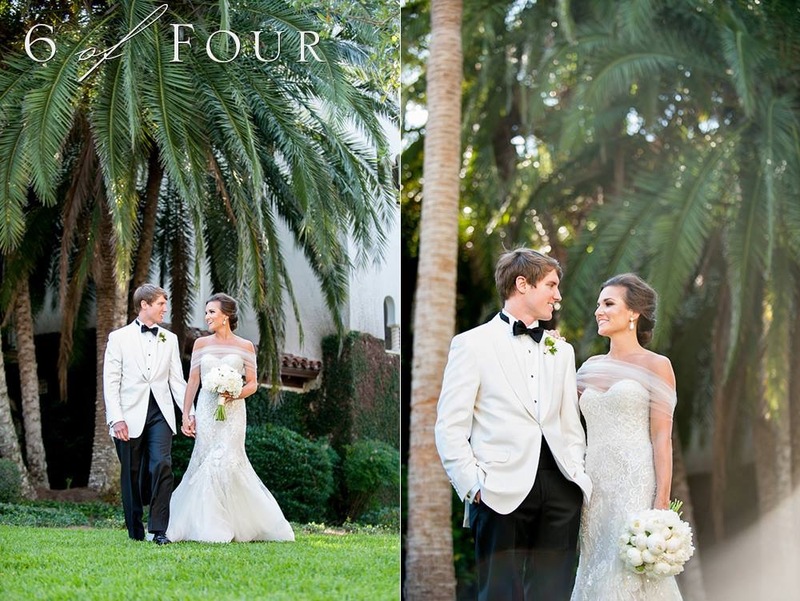 Holly & Ryan's wedding is absolutely everything! Maybe it's the breathtaking florals, beautiful beach, or absolutely stunning bride. Whatever it is, we can't get enough of it! 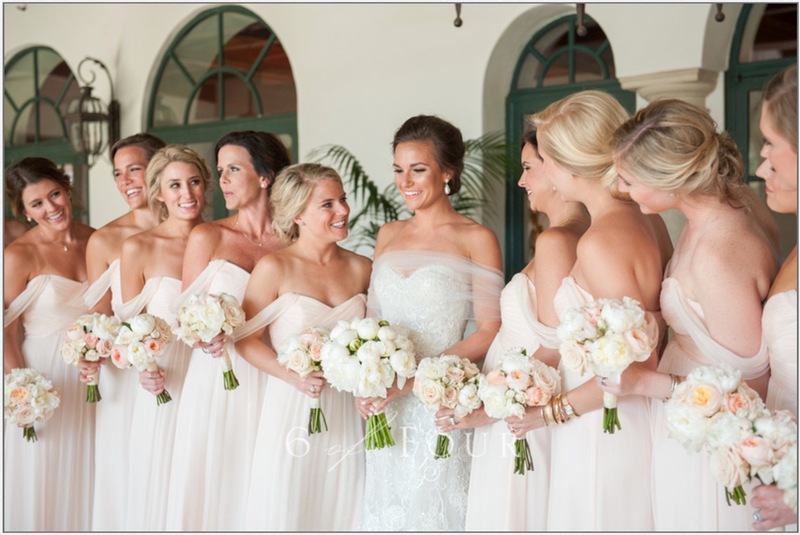 This beach wedding was designed to perfection with #BellaBirmingham outfitting the gorgeous bridesmaids in Amsale! How did you to meet? We were juniors in college (me at Alabama and him at auburn). His best friend, Barry, and my best friend, Lauren, met at a deb party we were all at one weekend and started talking (long distance). A few weeks later he invited a group of their guy friends (including Ryan) to his lake house on lake martin for a weekend, and invited Lauren to come and bring some friends (me), too. We met there and had such a fun weekend together! He texted me when I was on my way home from the lake that weekend and we started talking everyday from then on! He and Barry were sigma nus and lived together at the time in auburn. They had a bunch of big date parties that spring and invited me and Lauren to come for a weekend soon after the lake. 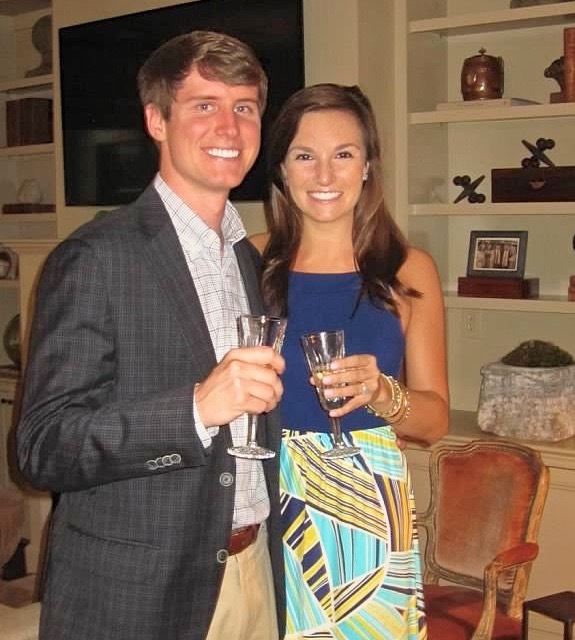 Soon after this, both me/Ryan and Lauren/Barry were “dating” and we all traveled back and forth between auburn and Tuscaloosa almost every weekend for the rest of college! Ryan and I had talked about getting married very early in our relationship and so he knew early on that I have always wanted to be surprised when he proposed. I thought it would be sometime during my last year of pharmacy school, but I had no idea when it might be. The weekend after I finished my finals (my 3rd year of pharmacy school) we had plans to “go to dinner to celebrate my brother in laws birthday” with my family. It was his 30th, and my sister had thrown him a big party at their house the weekend before so had lots of leftovers. She called Ryan and me on Saturday and invited us over for drinks while we waited on my parents to get in town. We didn’t live together so we both were just meeting there.. when I got there, Ryan was the only one at her house and I found him in their backyard (they had just redone it, so it is really pretty with a fountain and garden, etc.) where he proposed! I was completely surprised!! My family and his parents were hiding two doors down at their friend’s house and they came over to celebrate with champagne afterwards! We had dinner at ocean with our families and then a bunch of our friends came to Caroline and wither’s house afterwards to celebrate! Ryan had actually called Barry a few days before, so he and Lauren had come in town that day so that they would be there to celebrate with us. 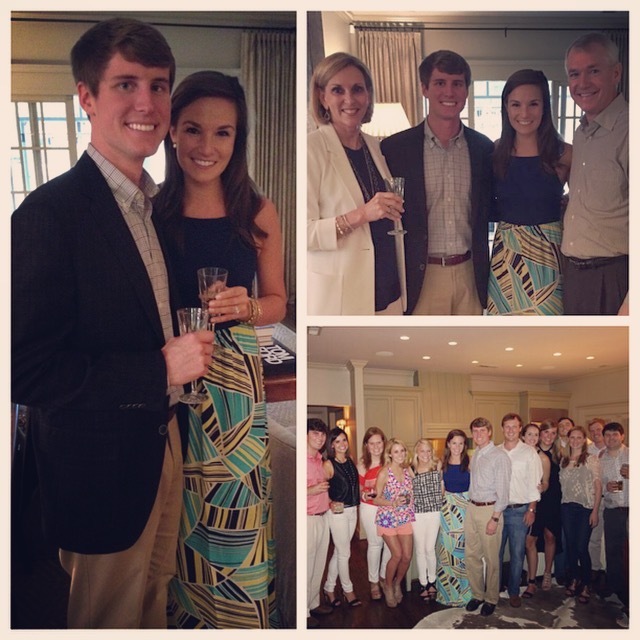 When I called her to tell her we were engaged she made up a story that they were at her cousin’s graduation out of state and she was so sad to not be with us, and then surprised me by showing up to the celebration that night! Location, location, location! 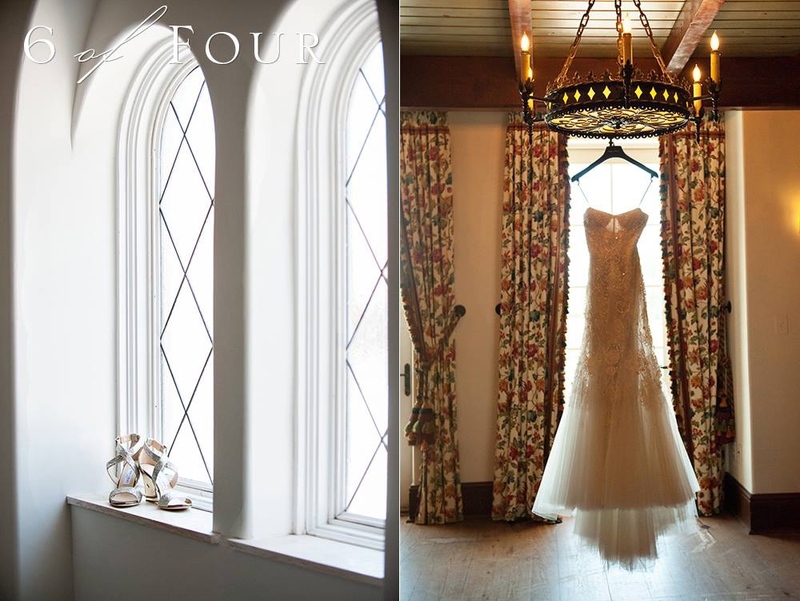 How did you choose your venue? What type of venue were you looking for? 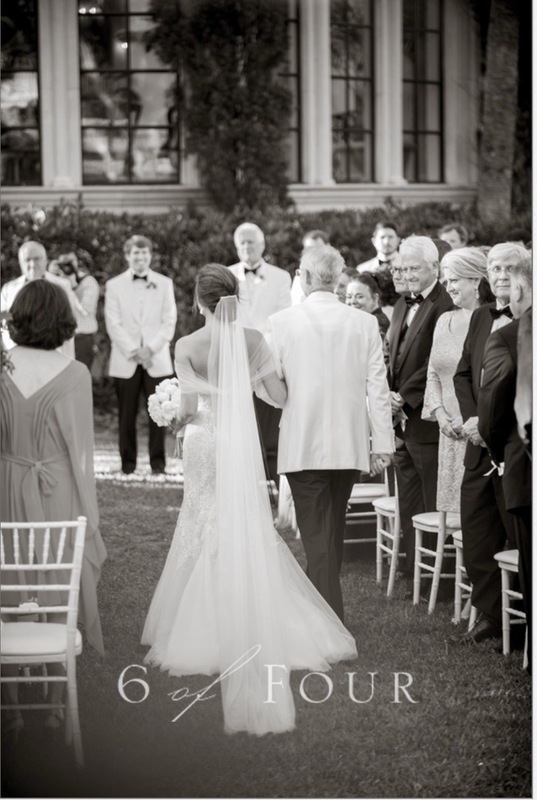 After my sister’s wedding in Newport, I knew I wanted a destination wedding. 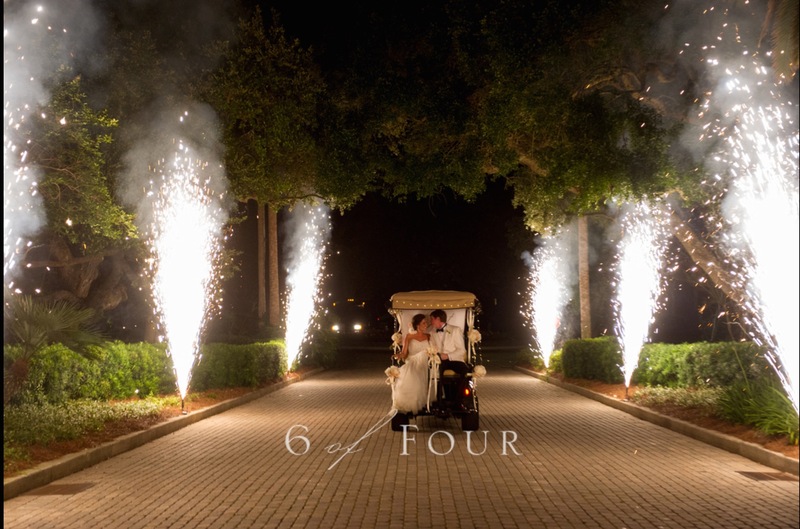 I came across some pictures of a beautiful wedding in sea island, Georgia while browsing wedding blogs on day and mentioned it to my mom, so she planned a trip for us to go one weekend the year before we got engaged (so that when I did get engaged one day I would know where I wanted the wedding to be)- we fell in love immediately! 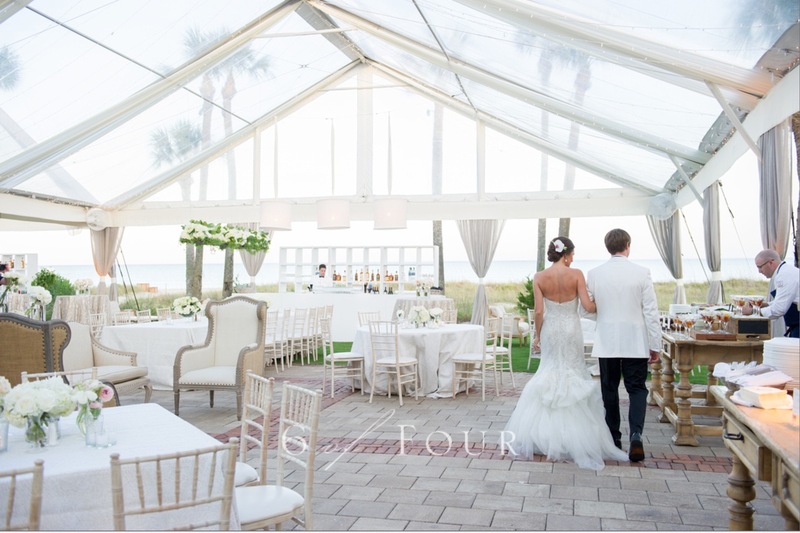 I have always wanted a spring or summer wedding somewhere coastal, and wanted a wedding weekend where our guests would all be close to us and would view as a vacation to which not only celebrated our marriage, but that they also would look forward to traveling to and would have a fabulous time! Who designed your beautiful gown? Where did you get it? Monique Lhuillier - Ivory and White in Birmingham. 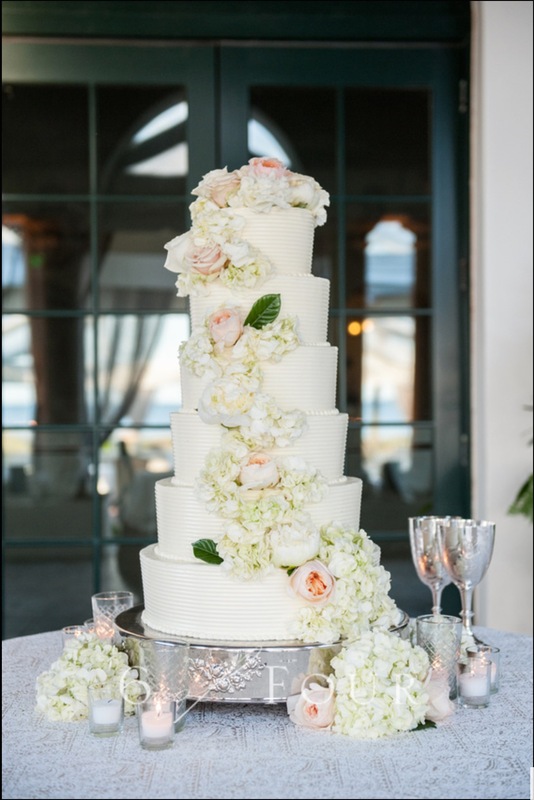 Pale colors (pale peach, pinks, creams and whites); and I wanted peonies everywhere (bouquets, arrangements, cake, etc.). 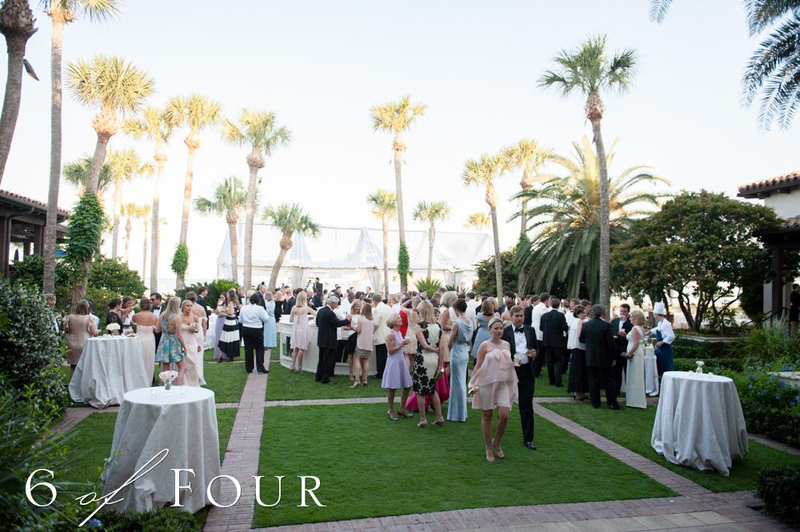 We chose to have the ceremony in the garden and the reception at the beach club of the cloister because it was right on the water and I loved the “classy beachy look” with the palm trees, water and the beautiful architecture of the cloister buildings behind us. 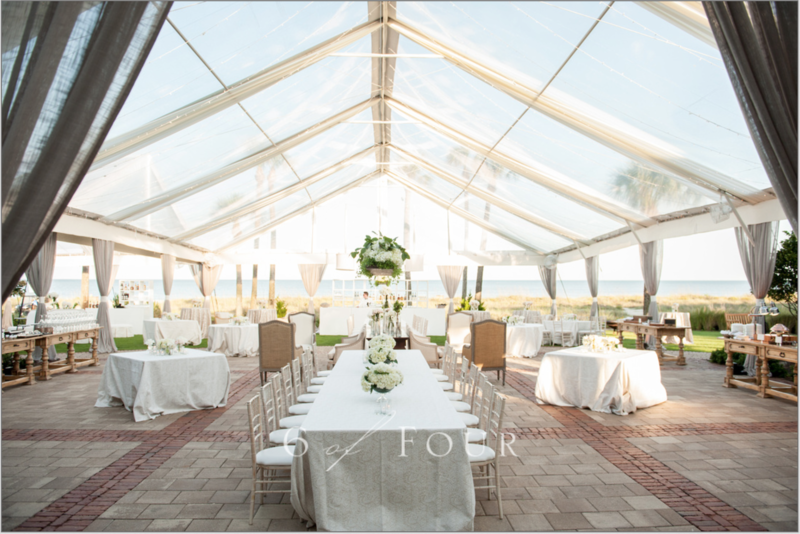 I really wanted to have the sea island beach view as our setting and for our guests to enjoy, and so we used a clear top tent that had amazing 360-degree views! I also wanted a lot of ceiling lights for when the sun went down, and so the ceiling of our tent was covered with streaming lights (and we had these cool illuminated ghost bars lining the tents). 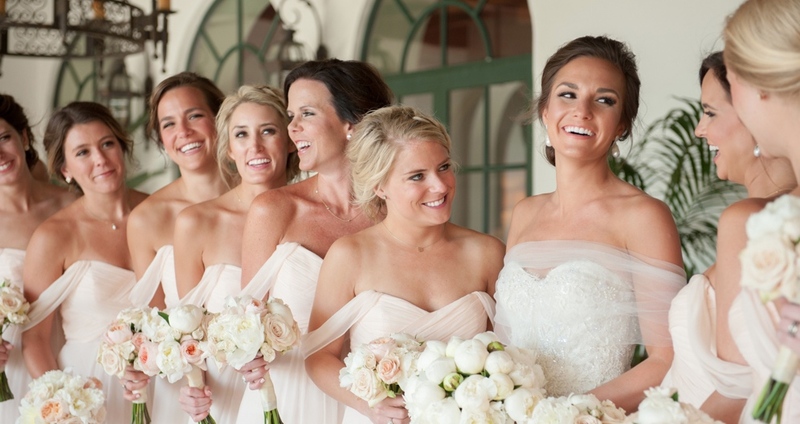 Tell us about your bridesmaids dresses! 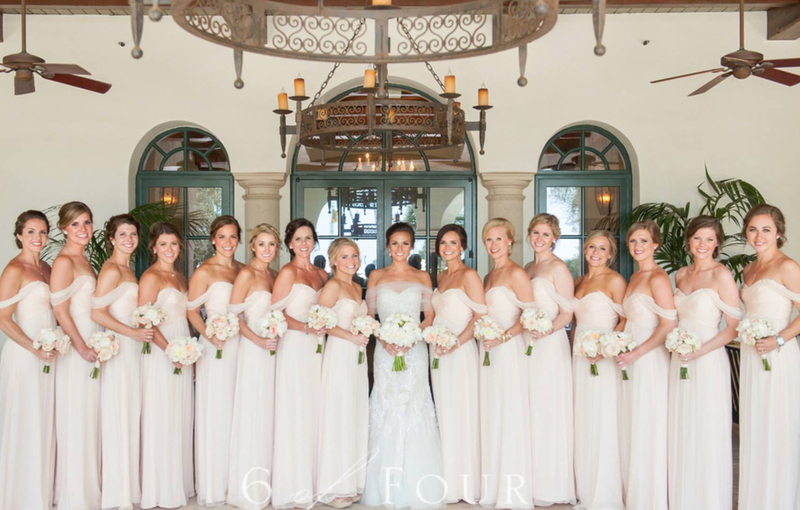 Amsale pale blush (bellini) chiffon, long dresses that draped off the shoulders! They were beautiful! 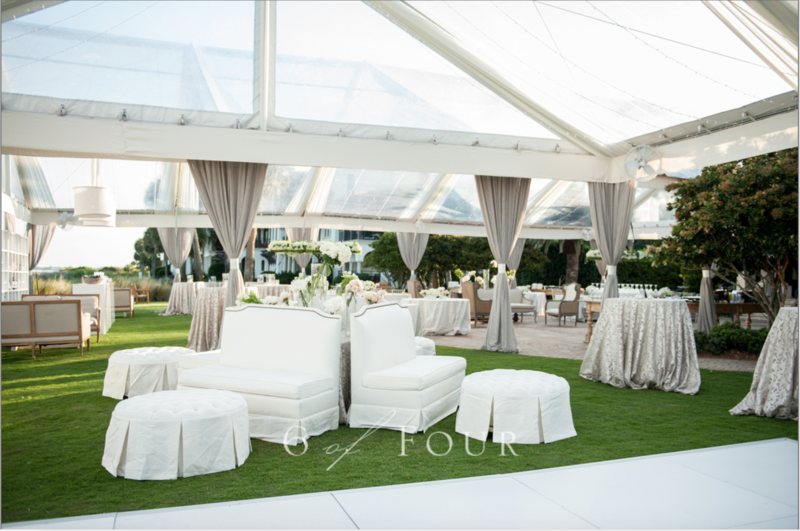 Must haves: ocean/beach scenery, lights, clear tent, peonies, neutral theme, fun band that kept guests dancing and having the best time, GREAT FOOD (I am a huge foodie!! We had amazing hor d’oeuvres passed around on platters during our cocktail hour, and multiple different stations during the reception including a raw seafood bar, shrimp and grits station, a crab cake station, a beef tenderloin/potatoes station, salad bar, etc.) and a good, pretty signature cocktail (the bartenders in sea island came up with my signature drink the week of our wedding: a watermelon and cucumber martini, garnished with a cucumber slice in a pretty martini glass served during our cocktail hour). Absolutely nothing differently! It was the PERFECT day and weekend. 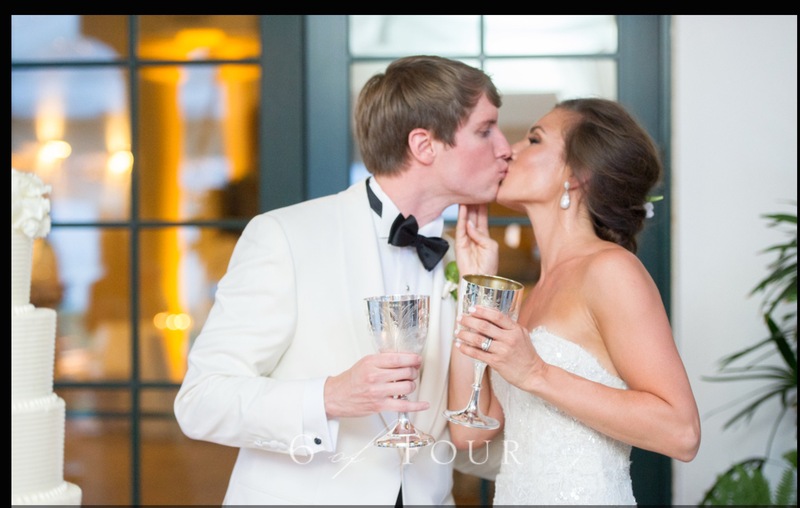 Favorite memory from the day! Too many to choose from! 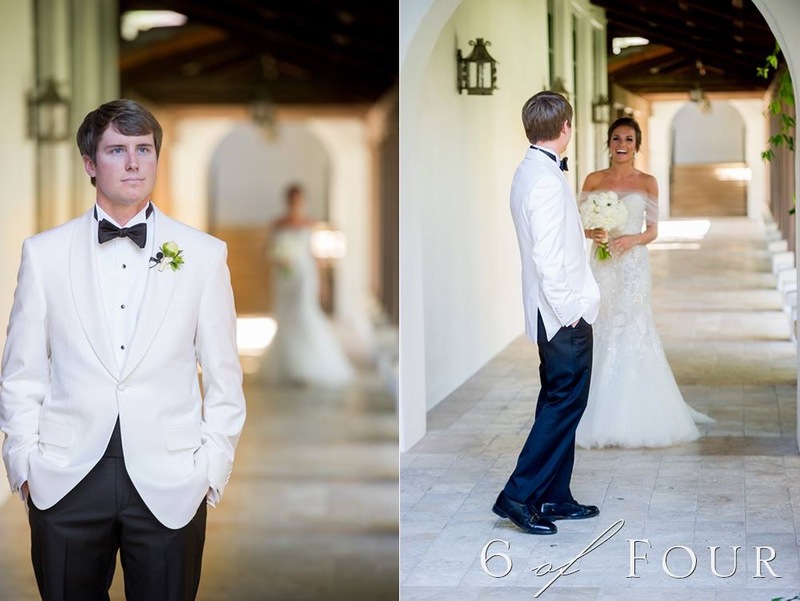 We did a first look, which was so special to both of us!! It was also so much fun hanging out with my parents/sister, and friends while getting ready before the wedding enjoying champagne and relaxing… the ceremony itself was so sweet and beautiful… and the reception was amazing and so fun getting to relax, dance all night with everyone to our incredible band and celebrate being married! !